PanPastel Ultra Soft Artist's Pastel. 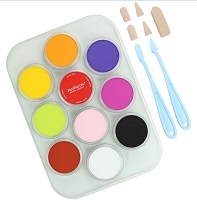 PanPastel Colors are genuine artists' quality pastels, uniquely packed in a pan format. They were developed so that artists can easily lift, apply, and control pastel color-just like true painting! The pan format holds the color like paint for easy application. Each PanPastel is loaded with the highest quality artists' pigments and have a rich, ultra- soft and low dust formulation. All of the professional-quality colors have excellent light-fastness, are fully erasable, and compatible with traditional pastel sticks, surfaces, conventional fixatives and other artists' colors.